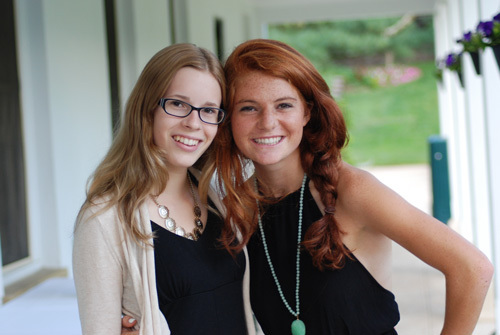 Oldfields School is committed to the intellectual and moral development of young women. In a culture of kindness and mutual respect, we encourage each student to make the most of her academic and personal potential. We seek to guide each student to grow in character, confidence, and knowledge by encouraging her to embrace the values of personal honesty, intellectual curiosity, and social responsibility. Our motto - Fortezza, Umilitade, e Largo Core- Courage, Humility, and Largeness of Heart, are the core values and beliefs that define our school culture. Oldfields School admits students of any race, color, religion, sexual orientation, national and ethnic origin to all the rights, privileges, programs, and activities generally accorded or made available to students at the School. It does not discriminate on the basis of race, color, religion, sexual orientation, national and ethnic origin in administration of its educational policies, admissions policies, financial aid programs, and athletic and other school-administered programs. Oldfields is accredited by the Middle States Association of Colleges and Secondary Schools and approved by the Maryland State Department of Education. In addition, Oldfields is a member of the Association of Independent Maryland Schools, The Association of Boarding Schools, the National Association of Principals of Schools for Girls, the National Coalition of Girls' Schools, the Association of Supervision and Curriculum Development, the Secondary School Admission Test, the Independent Educational Consultants Association, the Educational Records Bureau, the Potomac and Chesapeake Association of College Admissions Counseling, and the National Association of College Admission Counseling. Oldfields recognizes the NAIS and NACAC Principles of Good Practice.